Remember, long ago, when Internet search actually provided you with the most relevant results? Then search providers discovered that they could get paid for putting advertising, disquised as search results, at the top of the results. Today, Internet search is a 20 billion plus dollar industry and growing fast. Naturally, the operating system monopoly Microsoft is not going to let this kind of money go to someone else. 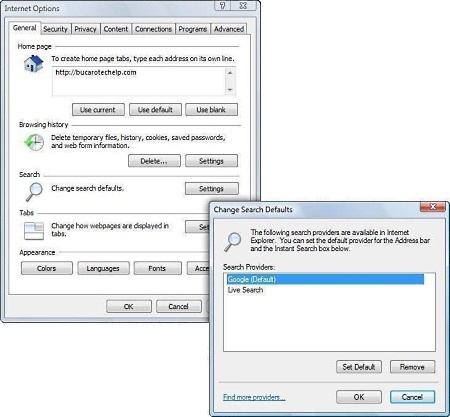 In Internet Explorer, the default search engine is Microsoft's Live Search. In Internet Explorer version 7, Microsoft makes it real inconvenient to change to a different default search engine. In fact, to do it, you're required to go to a Microsoft webpage. I'm not sure what percentage of people use Internet Explorer's search text box rather than a search engine from their "Favorites" list, or the search box available on almost every Web site, but if it's high, as more people adopt Windows Vista, Google is going to lose their under-pants. They need to expedite the release of the Google operating system and offer it free, along with copious information and free technical support. 1. In Internet Explorer's main menu or toolbar, choose Tools |Internet Options. 2. In the Internet Options dialog box that appears, in the Search section, click on the [Settings] button. 3. In the Change Search Defaults dialog box that appears, if Google.com is in the Search Providers: list (unlikely), then click on it to select it, and then click on the [Set Default] button. Then click on the [OK] button. 4. If Google.com is not in the list of Search Providers:, then click on the "Find more providers" link at the bottom of the dialog box. No - you just can't just type "google.com" into the list. You have to go to Microsoft's Web site.